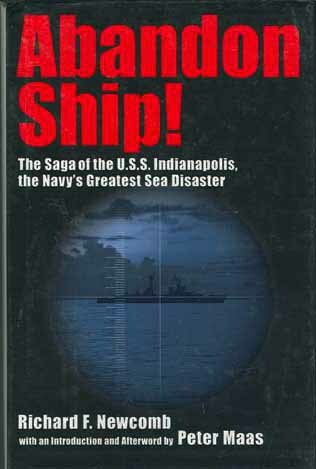 “ABANDON SHIP!” The Saga of the USS Indianapolis, the Navy’s Greatest Sea Disaster. By Richard F. Newcomb. Introduction and Afterword by Peter Maas. At midnight, July 29, 1945 the heavy cruiser USS Indianapolis (CA-35) lay almost half-way between the islands of Leyte and Guam in the Pacific. World War II was all but over as the veteran warship traveled alone. Then six Japanese torpedoes suddenly struck the vessel and the horror began. 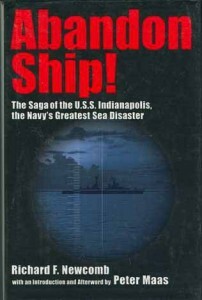 I-58’s sinking of Indianapolis marked the greatest U.S. Naval disaster of World War II, as 800 American’s died. Here is that shocking story! 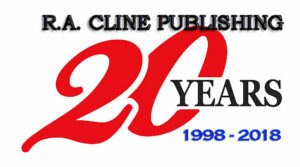 2001 Hardback edition with dust jacket. 326 pages, 20 black and white photos, 1 maps a USS Indianapolis crew roster and an index.